En español | Nearly three-quarters of Americans over 50 worry about being able to afford prescription drugs for themselves and their families, according to a new AARP nationwide survey. 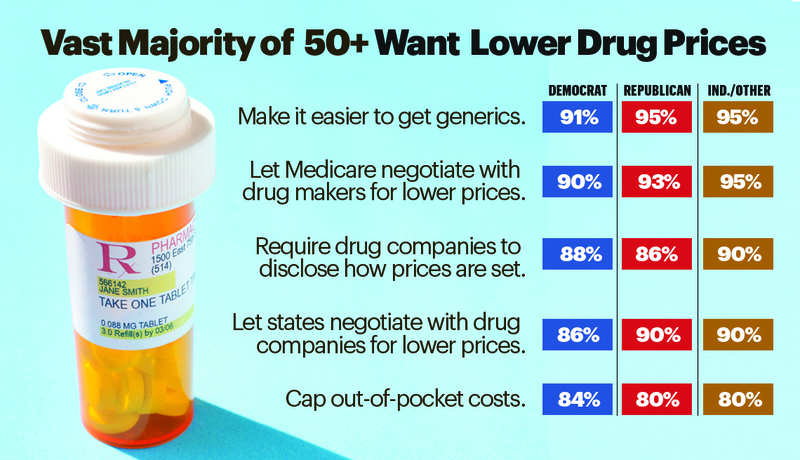 Across the political spectrum, these older adults overwhelmingly support policies that could lead to lower prices, including making it easier to develop new generics, allowing Medicare to negotiate prices and requiring drugmakers to explain how they set their prices. The survey results are being released in conjunction with the launch of AARP’s national campaign to convince federal and state lawmakers to curb the out-of-sight prescription drug prices. The “Stop Rx Greed” campaign will promote AARP’s four solutions to runaway drug costs. Support laws that promote transparency by requiring drugmakers to justify dramatic price increases. AARP’s survey clearly shows that concern over prescription drug prices crosses all party and ideological lines. Among all respondents older than 50, 72 percent said they were very or somewhat concerned about being able to afford the drugs they need for themselves or their families. And 90 percent or more of likely Democratic, Republican and independent voters said it should be easier for generic drugs to come to market and that Medicare should be allowed to negotiate with drug companies for lower prices. The survey also showed that prescription drug use is widespread among the 50-plus population, with 80 percent saying they regularly take at least one prescription drug. Forty-seven percent of those polled said they delayed filling or did not get a prescription filled because they couldn’t afford it. AARP’s campaign will include television ads, a strong social and digital media presence, and grassroots efforts via mail, email and phone by AARP’s 38 million members, in order to convince lawmakers to act. For the survey, AARP polled 1,218 likely voters between February 2 and March 4. The margin of error for the poll is plus or minus 3.92 percentage points.